The following games are most of the one-switch accessible music games that exist to the best of my knowledge. 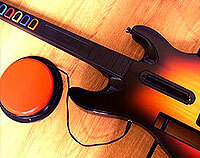 You can find more on a variety of accessible music games at the OneSwitch Blog. If you are aware of any other switch accessible games, or would like help in accessing these games, then please get in touch. Chuck Rock Dance (PC - Free) If you like Queen's "We Will Rock You" you may enjoy a game or two on this one-switch dance game. Played entirely with the SPACE BAR. Dancing Stage (PSone and PS2) The majority of Konami Dancing Stage (aka Dance Dance Revolution) games can be adapted to be one-switch playable. One hardware solution is to use a C-SID switch interface with 3.5mm stereo splitters and patch leads. 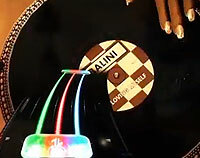 DJ Hero 2 (Various Formats) Within DJ Hero 2's beginner level, you can play using any button to play. This device should be fairly simple to switch adapt if needed. 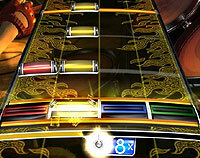 Guitar Hero World Tour (Various Formats) Within the practice area on the easiest setting, it is possible to play using the strum bar alone. As Gavin Philips demonstrated at the amazing AbleGames event, a simple hack can open this game up for one-switch play. Select EASY from the OPTION menu for "X" to play mode. 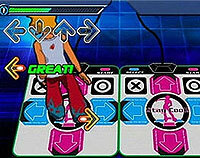 Almost all dance mat games can be played using multiple accessibility switches. One of my favourite dance mat games is The Jungle Book Groove Party for the PSone. Some great tunes (especially "We Are the Vultures" in Scouse-Ska style) and in two player mode you can help one another to get through each stage. There are also a number of alternative access controllers including the professionally built Hand Dance Pro.